Social networking technologies—such as Wikis, blogs and instant messaging—are increasingly being employed in business settings to support communication, collaboration and knowledge management. 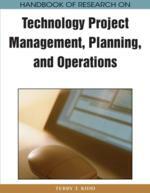 In this chapter, the authors discuss how a Wiki was used to facilitate project management in a large system implementation for a decentralized organization. Further, they show how it continues to add value to the organization after the project’s completion, supporting operational management activities while at the same time providing a platform for fostering and promoting innovation. They introduce important implementation considerations for deploying a Wiki in your organization, in addition to sharing observations from our own implementation that saw both successes and failures. A Wiki is a set of interlinking dynamic web pages that is specifically designed so that anyone can easily contribute and modify content. They are very often used as the basis for a collaborative community or in business as an inexpensive intranet or knowledge repository. Wikis maintain a history of changes to their content so that it is quickly and clearly evident who is responsible for what changes and content evolution. The power of the Wiki comes from its ability to facilitate knowledge discovery through interlinked and interrelated content. Wikipedia is the best-known Wiki, popular for its community-driven content that has become a fairly reliable collaborative encyclopedia. ASP: An application service provider (ASP) is an organization that hosts software as a service. Many blog, Wiki and web based e-mail providers are considered ASPs. Organizational Spam: Organizational spam is the e-mail overload that occurs as e-mail threads grow excessive or recipient lists and carbon copies are overused. E-mail is an inefficient communication mechanism for collaborative purposes because it functions as a threaded conversation rather than allowing progressive elaboration. Blog: A blog, or web log, is a chronological series of content typically created by an individual. Blogs are most often commentary or observations captured as text but may also include other media such as pictures or video. Waterfall: The waterfall methodology for software and systems development is a series of cascading steps of requirements gathering, design, development, testing and support. Each phase has a strict sign-off. Changes that would necessitate reverting to a prior phase are strongly discouraged. Adaptive: The adaptive approach to software and systems development encourages incremental implementation through a series of iterations, embracing changes and refinements along the way. Traditional phases such as design, develop and test still occur but with blurred boundaries and less rigidity. Net-Generation: The net-generation or “net-gen” are those born between 1977 and 1996, inclusive. This group is often stereotyped as having grown up with, and is constantly connected to, many of the technologies that are pervasive today. Wiki: A Wiki is a set of interlinking web pages designed for anyone to easily contribute or modify content. They are very often used as the basis for a collaborative community or in business as an inexpensive intranet or knowledge repository. Wikipedia (www.Wikipedia.org) is among the best-known Wikis, popular for its community driven content that has become a fairly reliable collaborative encyclopedia. Web 2.0: Web 2.0 is a broadly used term that may be applied to a number of web technologies but at its most basic level describes interactive and often editable web content that encourages information sharing and collaboration. Institutional Memory: Institutional memory is the collective knowledge and learned experiences of a group. As turnover occurs among group members, these concepts must be transitioned. Knowledge management tools aim to capture and preserve these memories. Social Networking: Social networking is a technology enabled means to develop communities based upon shared interests. Social networks utilize one or more of an array of mediums such as blogs, messaging, discussion threads and others. Social networking sites are typical examples of web 2.0 applications.